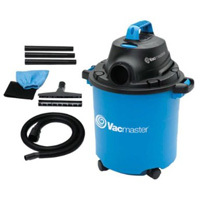 For a compact, inexpensive wet/dry vacuum, the Vacmaster VJ507 has more than satisfactory suction and blowing capabilities. It can handle small to medium cleaning tasks easily, whether wet or dry. We were surprised by how quietly it runs too. There were some instances in which it tipped over, mainly because the hose is somewhat stiff. However, it’s otherwise durable and reliable when it comes to performance. At $44.97, it’s very affordable and has the requisite tools for cleaning the house, car, or workshop.